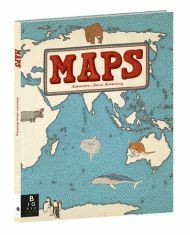 Beautifully illustrated kids atlas of the world with 52 maps. There is a map of each continent, regions and some individual countries. Each map features geographical features, political boundaries, place names, points of interest, native creatures & plants, iconic personalities and customs. A fun introduction to geography.